Shermain Hardesty at a pitahaya farm in San Diego. This past year we’ve seen several respected leaders in the California sustainable farming and agriculture movement retire after many years of tireless hard work. To honor them (and as an excuse to catch up! ), we set up casual conversations with a few of them to hear their reflections on the past few decades and pontifications of the future of sustainable farming in California. Read on for highlights and the full transcript of our chat with Shermain Hardesty, Director of the UC Small Farm Program. Last July, she retired after serving California farmers for more than 30 years, including 13 years as a Cooperative Extension Specialist. Early in her career as an economist, she worked for the CA Rice Growers Cooperative (very different than small farms!) and consulted 10+ years for produce commissions and farms that specialized in specific types of produce. She started tuning into small farmers around 1995, and in 2002 she became the Director of the UC Center for Cooperatives. 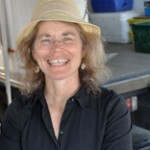 In 2007, she became Director of the UC Small Farm Program. Small farmers & food justice efforts, or not? FarmsReach: Having served farmers and ranchers for more than 30 years, how would you say the needs of the farming community have changed or stayed the same over the years? Shermain: I’d have to say that markets are much more competitive overall than they used to be, since there’s so much more international involvement. There are so many diverse sources for each product now. On the farm, crop mixes have definitely changed in California. Things like our water resources have gotten more and more erratic, and Mother Nature’s weather patterns are more uncertain. In production, regulations have gotten much more onerous and expensive for [smaller] farmers over the past 30 years. The per-unit cost of compliance for smaller-scale farmers is a lot higher. The rules are well-intentioned for food safety, but I’m not convinced they are risk-based. There’s very little recognition that the way that smaller scale farmers operate and sell their product create less exposure for outbreaks. In other words, when people buy salad mix at the farmers market, they probably will eat it in the next couple of days; whereas when people buy containers of salad mix at the grocery story with their “use by” date up to 17 days later, and when the containers have been held at who-knows-what temperature at the grocery store, there are these other risks that need to be recognized. This is the ongoing fight. It’s well-known how difficult it can be for beginning farmers to break even and sustain their farm business. What are some of the key metrics – beyond profitability – that you think all new farmers should track most closely? Farmers have to recognize the number of hours they’re spending on different types of tasks. They also need to understand how their marketing costs (both costs and time) are different for different market channels. For example, when they’re involved with selling at farmers markets, they need to recognize hours spent preparing their crops, driving, being at the market all day, etc. They’re also usually not paying themselves a salary. What I’ve been concerned about lately is that a lot of our smaller scale farmers are highly diversified, and it’s very difficult for them to determine what their costs are for each crop, especially with few support staff. It’s been very difficult to do any real farm management analysis with smaller scale farmers. I’ve actually heard from some well-established farmers that it’s not really how efficient you are with your production practices; it’s how well you market them. How well can you tell the story? And, how well can you develop relationships with your customers. And, therefore charge as much as you can. 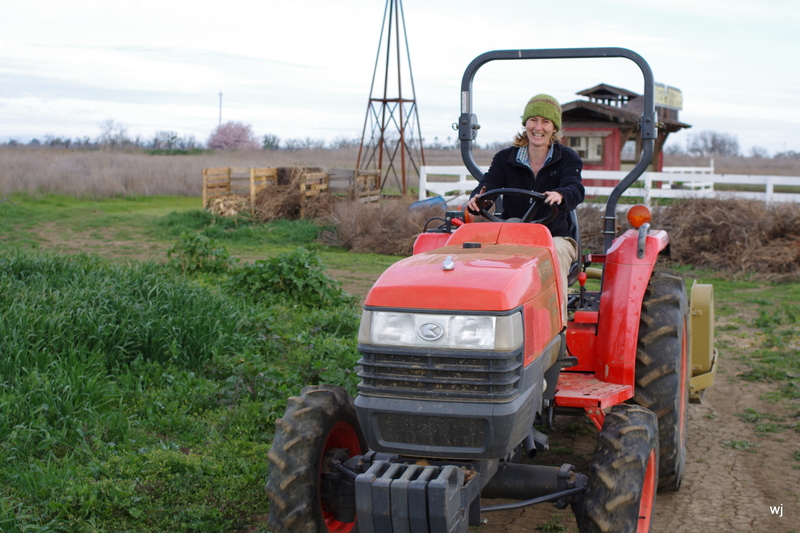 In this week’s Member Spotlight, we’re heading up to Sacramento/Davis to talk with Elle Huftil-Balzer, Farm Manager at Soil Born Farms and Farmer/Owner of Sidecar Farm in Winters. Elle began working at Soil Born as an apprentice in 2010 and then worked at the Sacramento Natural Foods Coop and at Feeding Crane Farms. In 2012, Elle graduated from the Center for Land-based Learning’s (CLBL) CA Farm Academy and went on to establish her own ½ acre vegetable and flower farm, Sidecar Farm, which is an incubator plot located at CLBL. In addition to her work at Sidecar, Elle is also now the Farm Manager at Soil Born Farms where she’s in charge of planting and harvesting, coordinating the pack, quality control, and distribution of produce, and managing restaurant accounts. She also works as Field Manager for Green Corps youth, teaching, directing and mentoring during their farm interactions. She does a lot! Read on as we talk with Elle about her many years farming, what advice she’d give someone just starting out, and which piece of equipment she can’t live without! FarmsReach: How many years have you been farming? Elle Huftil-Balzer: This is my fourth season farming, though maybe it could be technically my 5th. I worked my own 1/2 acre, selling to a 10 person CSA and restaurants part-time last year while also working full time with Soil Born, so that counts as 2 seasons right? FR: How did you get into farming? What do you love most about it? EH: I got in to farming when my partner and I decided to move to Davis. He was excepted to UC Davis for their PhD program and I wanted to be outside and working with my hands. I found the apprenticeship at Soil Born, applied, and was excepted. That was the beginning of the end for me. I love what I do. What I love most about it is being physically tired at the end of the day and knowing that I worked hard for something tangible and good. Farming just seems like the right thing for my soul. FR: Which question(s) are you most asked by other farmers – either new or experienced? What is your response? EH: The question that most folks ask is: What is wrong with my tomatoes? It is usually home gardeners, and I try and trouble shoot with them, but there are so many factors that could be a part of whatever their issues are. I usually don’t come up with a solution, just suggestions on how to possibly make the situation better. FR: What was the most important piece of advice you received when you were getting started? And/or, what single piece of advice would you give a new beginning farmer? EH: I don’t know that I solicited anyone for advice because I just sort of jumped into it all. However, if I had to give advice, it might be: Farming is hard work, not just physically hard, it is also mentally trying. It isn’t as romantic as you might think it is. When the sun is coming up and everything is golden and quiet, and you start your harvest, there’s some romance in that. Bit overall, you have to be organized, creative, smart, and strong willed. You will probably fail at some point, so just keep going and learn from your mistakes. Though I don’t know that I am in the position to be giving advise, I myself am not nearly experienced enough to be doling out sage words. FR: What is the strangest (or funniest!) thing you’ve learned since starting your operation? EH: Hm, I think it is funny to find fruit and veggies that look like people. FR: Which piece of equipment can you not live without, or what would your dream new piece of equipment be? EH: Something I could not live without is my hands. I know and understand the place for a tractor and its tools, but I love using my hands for things. Sometimes driving a tractor separates you from the land. Pulling some weeds by hand reminds you of what you’re made of and gives you time to ponder life. FR: What do you like to do in your free time? Hobbies outside of farming? EH: In my free time, I like to run and play ultimate frisbee. I’ve been playing competitive Ultimate now for 12 years, it is getting more difficult as the farming has worn my body down a little, but I still love the community and competition of the game. Thank you, Elle for sharing about your farming life with the community! If you have questions for Elle, get in touch. If you have questions or words of wisdom about your farm or ranch, visit FarmsReach Conversations and post a question or comment! Do you know another farmer that would be interesting to profile? Get in touch. We love to hear from you! A resettled young couple in Nebraska, 1936. Photo by Arthur, Rothstein/Library of Congress. This article was first published on Civil Eats, June 2014. This article is now being republished with permission from the author, Kristina Johnson. Kristina is a Bay Area, freelance journalist focused on agriculture and rural life. When a friend of mine moved to a rural part of California, she called her new home “BYOB” or “Bring Your Own Boyfriend.” “The pickings out here are slim,” she said. The problem with this advice was that my dater’s luck in the city hadn’t been so great either. And on the many nights when I waited for a guy to call, I doped up on rural romances. I treated my disappointment with the hope that outside city limits there was a place—Farmland, America—where the cowboys were monogamous and the vegetable growers knew how to ask a girl out. So I started asking farmers about their love lives with plans to write about what I found. But I also had my own agenda: I wanted to know if I moved to the country whether there would be someone there worth having a relationship with. I was looking for the pastoral version of a romantic cheat-sheet, a farmer’s guide to successful matches. There has been unprecedented growth in women farmers across the US in recent years. Paralleling this upward trend, the number of women-focused agriculture networks, funding opportunities, and technical assistance training also continues to climb. Women farmers are [finally] being recognized for their contribution to agriculture, not only as farmers’ wives, but as farm owners and operators themselves! This week we spoke with Kari Hamerschlag, Senior Analyst for the Environmental Working Group, who was the keynote speaker at last month’s 4th National Women, Food & Agriculture Network (WFAN) Conference,”Cultivating Our Food, Farms and Future,” in Des Moines, Iowa. Kari spoke about the need for better policy-making to build a more democratized food system, and the important role that women farmers play in the future of agriculture. Read on as Kari tells us why we need more women in the food and farming world, what obstacles they may face, and why support networks and community are so vitally important! And, just today: We launched our New Women in Agriculture Toolkit with resources on the growth of US women famers, women farmer networks, funding opportunities and more. If you have additional resources to share, please let us know! Every week, we’ll spotlight a FarmsReach Featured Farmer. Our Featured Farmers are brimming with great ideas and knowledge to share with the farming community. Feeling a spark of curiosity? There’s no question too simple or tough. Ask a question or add a Conversation and we’ll be sure it’s answered within a day or two. This week, we’re featuring Emma Torbert, from The Clover Leaf Farm. Emma got her masters in Horticulture from University of California at Davis and currently works for the Agricultural Sustainability Institute (ASI). This week, we’re featuring Pilar Reber, founder of Sunnyside Organic Seedlings and a graduate of the UC Santa Cruz Center for Agroecology and Sustainable Food Systems program. Sunnyside Organic Seedlings focuses on providing quality certified organic seedlings that are produced in a socially and environmentally responsible manner. This week, we’re featuring Judith Redmond, one of the dedicated owners of Full Belly Farm, a certified organic farm located in the beautiful Capay Valley of northern California. Their farm has been certified organic since 1985, where they strive to continue supporting local food systems and creating a strong local food economy.